i’m so excited that my friend Jess from Craftiness is not Optional is now turning her crazy bank of tutorials into real PATTERNS! 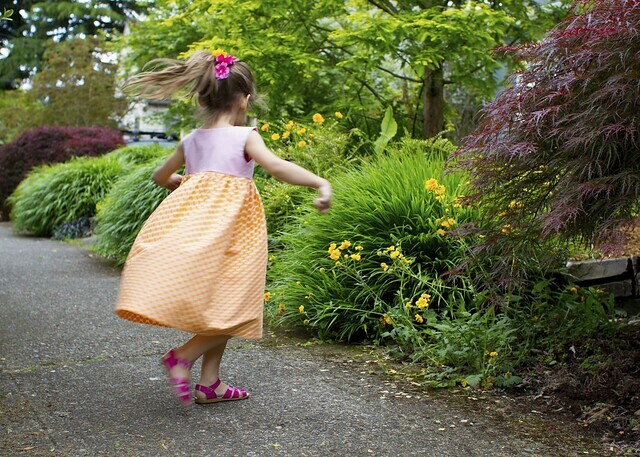 she started with the Bapron, and now she’s venturing into her trademark little gal clothes. check it out, it’s the Junebug Dress! this pattern means a lot to me, but i didn’t even realize it until I was sewing it up as a tester. 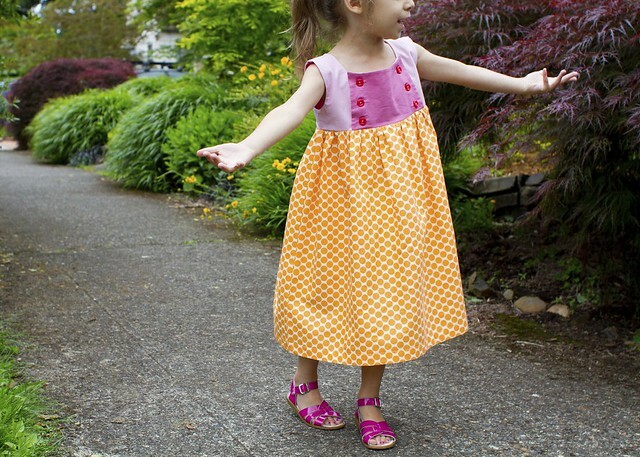 the Junebug Dress (in free form) was my remix challenge for the first week of season 3 of Project Run & Play. i flipped the bodice around, added some overlays, and it became the Sweet Tartan Dress (tutorial here) and sort of “put me on the map,” blog-wise. my remix of the Junebug actually led to the first emails between Jess and i – we became quick buds, then decided to do Vintage May together, and have been in pretty regular contact ever since. she’s an inspiration and SUCH a hard worker! recently, Jess’ daughter Sadie and Em have become the cutest pen pals – they keep trying to talk us into a playdate (kinda hard when you live 700 miles away, but we’ll make it happen someday). 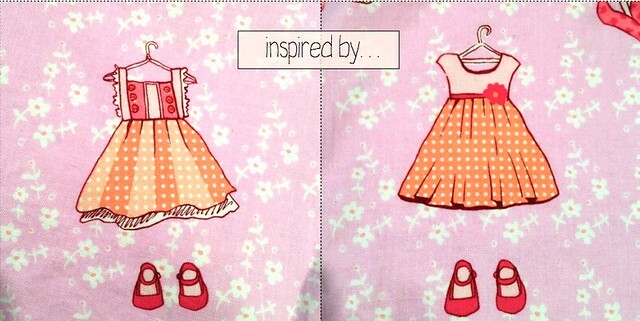 so a lot has come from this one little dress! I should probably talk about the pattern – it’s a great pattern. 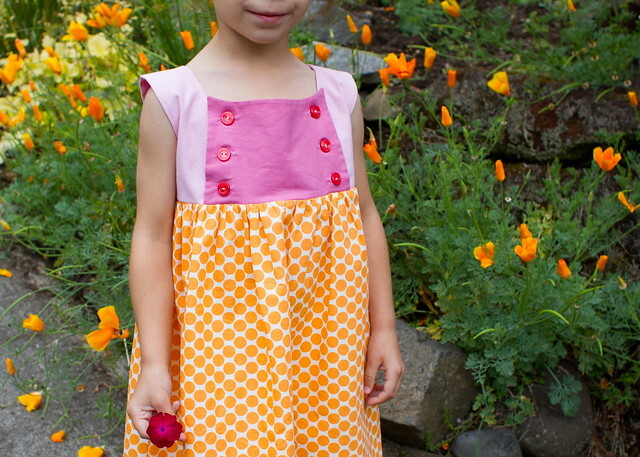 Jess pumped up the volume with sleeve/sleeveless and dress/tunic options, plus great step-by-step photos and instructions to help you sew a darn cute little garment. it goes from size 18 months to 8 years (thanks to digitizing/grading services by Melissa), and the bodice fit is pretty generous, meaning i sewed a 2T bodice for Em (with a 5T skirt). 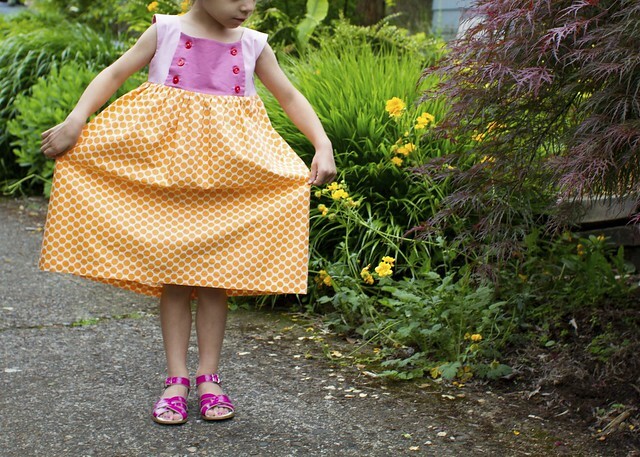 since it has plenty of growing room, it’s a pattern you could get lots of uses out of as your little gal gets bigger. doesn’t that dress on the left look awfully close to a Junebug?? Em liked the one on the right up there too, so i mixed both together until I got this…with two pink kona solids on top, red buttons, and amy butler full moon polka dot in tangerine (which i believe i picked up at cool cottons). it was such a pleasure to pattern test for Jess! she presents sewing in such a friendly and approachable way, and i’ve learned a lot by following her blog. i’m a fan. i celebrate her entire catalog. and here’s a little glimpse at Portland spring. it’s warm, we head out when the weather looks fine, and then…it starts raining. i mean, it just started sprinkling, but Em thought we needed to immediately run for the hills. we made a mad dash inside, just like YOU should make a mad dash over to CINO to pick up the Junebug Pattern! see what i did there? hehe. stay dry out there, you guys. So adorable!! You and Em do such a good job at choosing fabric for projects! 🙂 the Junebug is special for me, too. A couple of years ago, when she first ran the Junebug sew-along, I dared to try it and, wouldn’t you know, I could make my then-8-month-old the most adorable little dress! The Junebug started crafting and sewing again for me, and I am so grateful to Jess for it! ‘see what i did there?’ I love that 🙂 And that’s such a sweet story, I love that you found this connection over 700 miles, it just makes me smile. 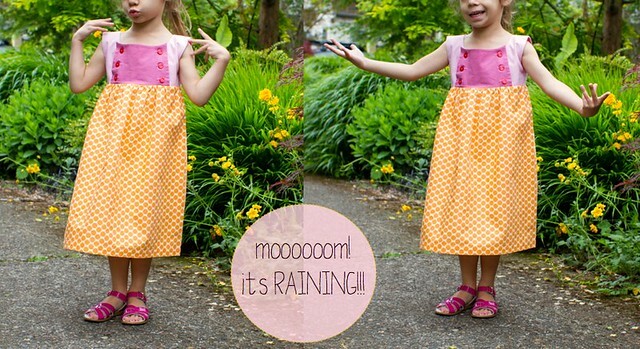 Your adorable little girl is rocking this little dress, I LOVE those fun colors from your inspiration. I’m on a short freeze from buying. all. the. patterns. but have a feeling that won’t last terribly long, and this one is on my short list!! I loved your tartan version of the Junebug- and this one is adorable too… sweet color combo. And such pretty flowers in your hair, Em! Yea! This is awesome. I love how collaborative you and Em are. Inspirational! This dress reminds me of a snow cone! It is full of sunshine cheer and perfect for the summer! So, so pretty! Adorbs! 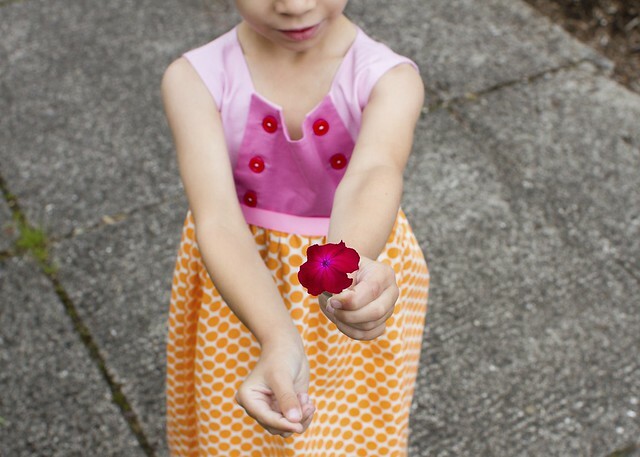 I love getting input from the kiddos – I think they always end up cherishing the clothes more :-). Great-looking pattern, must check out! SOOO cute! Love the fabric combo you two came up with. Don’t forget that next Friday is Hawaiian shirt day. love your color combo choice! Perhaps it’s a reaction to a long, grey winter, but I’ve been loving pink and orange together lately. 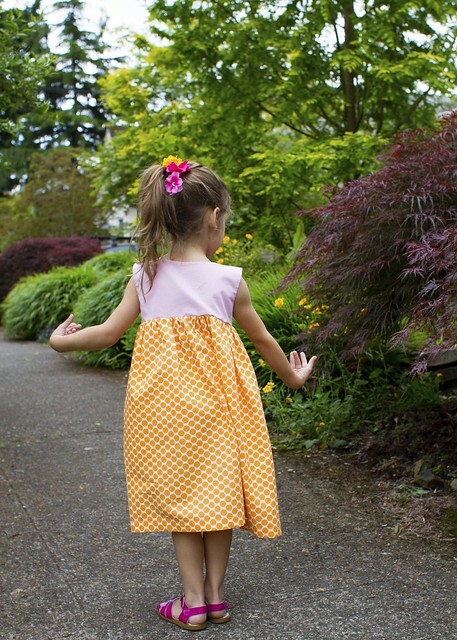 This dress is adorable, and the pattern certainly has sentimental significance for you. Glad Em loves it! such a fun fabric combo! i can confirm that the fabric came from cool cottons…i remember you buying it the first time we went there together! Haha…is Office Space the next in your film petit series?? This is an adorable dress, and I love the tartan version you made also. The dress that started it all. “all” being our awesomeness. lol…but seriously. This post just made my day…made me smile so big and be thankful to have such an awesome pal who I haven’t even “met” yet. Love ya girl! Oh and the dress! I ADORE that little drawing Em picked out….so quirky and unexpected and perfect! it turned out fantastic and it totally looks like that little picture! I love this dress…especially that it was a collaboration between the two of you! you know I love the mama daughter collaborations 😉 The colors are perfect, so springy.